When I was a student in Germany, I used to take the train into Frankfurt every few weeks. The only trouble was, that the ticket machines at the station were often out of order. I remember that the first time this happened, I asked another passenger what I should do, and they told me to write down the serial numbers of all of the ticket machines, and if anyone wanted to see my ticket I should tell them what had happened and prove it using the numbers. So what should you really do in such circumstances? Writing down the number of the machine is certainly a good idea. Apparently, if you are checked by a ticket inspector, they write down your name and address and send someone to see if the machine really was faulty (and presumably fix it). However, I have since heard of people who then received a bill for the “erhöhtes Beförderungsentgeld” (that’s the fine for travelling without a ticket), because the machine was allegedly working. I always wondered how such things happened – now I know! Having retrieved my bank card and noted the machine number, we waited for our train to arrive. 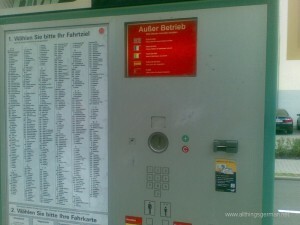 After a few minutes, the machine reverted to its normal state and the “Außer Betrieb” notices disappeared. We bought our tickets with cash and the train eventually came. After making some enquiries, I still do not have anything official, but I do have some new advice. Not only is it wise to note down the number(s) of the machine(s), but you should advise the train driver as well. It is then up to him or her to either let you travel without a ticket – something they can then vouch for when the ticket inspectors get on the train. Or they can let you off at the next stop and wait while you buy a ticket there. I emphasise the wait because normally the time at a U-Bahn stop would not be sufficient. Finally, if ticket inspectors do get into your carriage, it is important to make yourself known to them straight away and get them to talk to the driver. Do not wait for them to come to you! By the way, the machine really does have to be out of order. If you don’t have the right change, and the machine is not taking notes or bank cards, then that is not considered sufficient to travel without a ticket. The alternative is to travel a different way – if you can! Not just the price of food went up last year, travelling by train became more expensive from the middle of December, as the Tagesschau news reported. The prices for tickets, bahncards and reservations rose, even the price of the “Schönes-Wochenende-Ticket” went up to 35EUR. Deutsche Bahn have, however, added new destinations for the fast ICE trains, which may well be very useful for people wanting to travel around Europe, with the new connections to Paris, Vienna and Copenhagen. People living in Germany who have a Bahncard and who travel around Europe may be able to make use of the RailPlus option – until now an optional (charged) extra, that according to the Tagesschau article is now included in the price of the Bahncard 50. All these prices rises may not go down too well with travellers, who at the moment are suffering at the hands of the train drivers’ strikes that took place in the autumn of last year and may well be repeated in the early part of 2008 if talks break down again.